EPFIndia.com - Are you having issues related to loss of password for EPF UAN Login? Are forgotten your UAN Login id password? Here is tutorial for how to get back your EPF UAN Id password and how to login easily in EPF UAN portal. Password (Which you assigned at the time of register). So, if you have mobile number and password than only you can sign in UAN portal, we all know this but what problem users face is sometimes they lost the number which they used for signing up at UAN portal and also forget password. 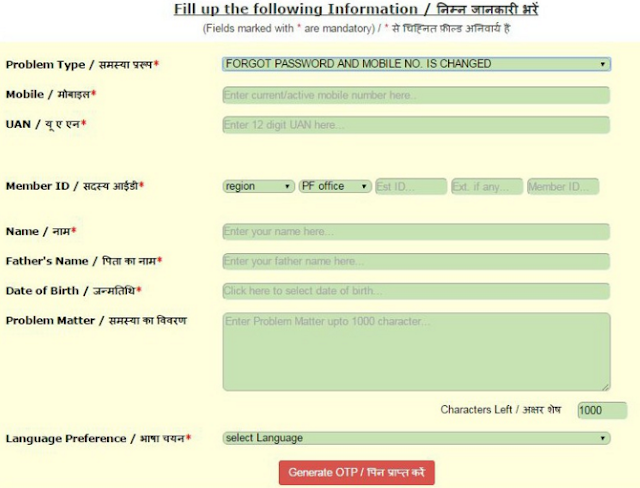 So, here is tutorial to retrieve your UAN account with new mobile number and set new password. 1. Go to UAN online helpdesk portal. Here on this tab you will find "member" option, just click on that "Member" click. 2. Here you will receive Query list which you might have one; like below mentioned 7 queries you can resolve it from UAN Online Helpdesk Portal. 3. To check UAN Number :- To check UAN number you need to enter mobile number, your father name, date of birth. So, if you have your known registered mobile number with you, you can check your UAN number. 4. How to retrieve new password with new mobile number (Forgot password and mobile number changed). Below is tutorial for how to register new password if you even forgot your registered mobile number. This is one of the most searched query with UAN number. if you have lost your password and lost your mobile number too, than this is what you need to do. In that case, just select the "Forgot password and mobile no is changed" option from drop down at UAN Helpdesk. 5. To change the Name or to update or to edit or to correct your name or your father name, you need to select "Incorrect Details option" where you can enter and submit request to UAN official about wrong father name, name, date of birth and date of joining are updated here. Note :- after using any of the service which is mentioned in above image, you will receive one OTP password on your mobile number. This will help you to verify yourself to UAN portal and your request will be proceeded. If you find some technical error at your portal, you can submit offline query with your employer too. Or you can contact EPF officials at below mentioned toll free number and email id too. If you still have query related to UAN or EPF or UAN Number, you can comment below, we will address queries which are not addressed in post.